At Schnauzers Rule we are dedicated to protecting your data and privacy. We recognize that your privacy is important. This document outlines the types of personal information we receive and collect when you use Schnauzers Rule, as well as some of the steps we take to safeguard information. This will help you make an informed decision about sharing personal information with us. Schnauzers Rule strives to maintain the highest standards of decency, fairness and integrity in all our operations. Likewise, we are dedicated to protecting our customers' and online visitors' privacy on our website. 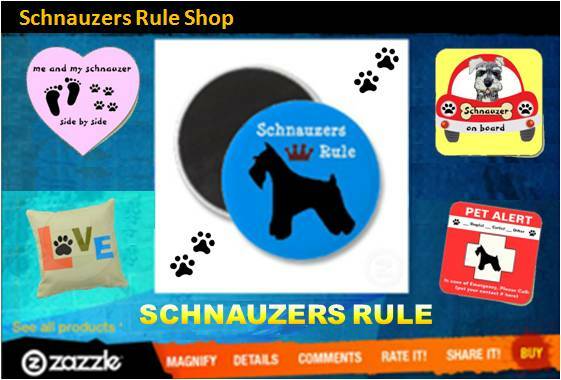 We receive an affiliate commission for some of the products/services sold on Schnauzers Rule. The affiliate services platforms we use are Amazon, ShareASale, ClickBank and Commission Junction. If you choose to refuse Schnauzers Rule's cookies, you may not be able to fully experience the interactive features of the site. Schnauzers Rule may collect personally identifiable information from you in a variety of ways, including, but not limited to, when you visit our site, register on the site, or fill out a form, and in connection with other activities, services, features or resources we make available on our site. Schnauzers Rule also uses Facebook commenting. Facebook stores all of your comments and may show them on your timeline, depending on your Facebook settings. Schnauzers Rule contains links to other websites that may be of interest to you. However, once you have used them to leave our site, we do not have any control over that other website. Therefore, we cannot be responsible for the protection and privacy of any information you provide while visiting such sites. These sites are not governed by this privacy statement. Always exercise caution by reviewing the privacy statement of the website in question before continuing to use it. If we sell Schnauzers Rule, the information we have obtained from you through your voluntary participation in our site may transfer to the new owner as a part of the sale so that the service provided to you may continue. In that event, you will receive notice through our website of that change in control and practices, and we will make reasonable efforts to ensure that the purchaser honors any opt-out requests you might make. By using the website you acknowledge, understand, and agree that all decisions regarding the health and well-being of your pet are completely your own. At no time is the website information intended to diagnose, treat, or cure your pet and is not a substitute for veterinary care provided by a licensed veterinarian. For any medical or health related advice concerning the care and treatment of your pet, always consult your Veterinarian. Schnauzers Rule does not accept any responsibility for any loss which may arise from reliance on information contained on this site. Permission is given for the downloading and temporary storage of one or more of these pages for the purpose of viewing on a personal computer. The contents of this site are protected by copyright under international conventions and, apart from the permission stated, the reproduction, permanent storage, or retransmission of the contents of this site is prohibited without the prior written consent of Schnauzers Rule. Some links within this website may lead to other websites, including those operated and maintained by third parties. Schnauzers Rule includes these links solely as a convenience to you, and the presence of such a link does not imply a responsibility for the linked site or an endorsement of the linked site, its operator, or its contents (exceptions may apply). The website may also contain an online store with ordering capabilities, artwork, photographs, data, text, trademarks, logos, and other materials which are copyrighted and the exclusive property of Schnauzers Rule or used herein with permission from the rightful parties and may not be reproduced. Reproduction, distribution, republication, and/or retransmission of material contained within this website are prohibited unless the prior written permission of Schnauzers Rule has been obtained. By using the website you agree to bear all risk associated with its use and hold harmless Schnauzers Rule and all its agents from all claims arising out of or related to your use of, or inability to use, the websites to which they are linked. Furthermore, you agree that Schnauzers Rule and/or its contributors of information to the website will not be liable for any damages or loss or alleged loss to be caused by you in reliance on such information. DISCLAIMER: Schnauzers Rule contains links to other web sites, as advertisers, affiliate links, other information and social media sites etc. Please note that when you click on any one of these links, you are moving outside of Schnauzers Rule to another web site completely. It will be your responsibility alone to read the privacy statements, rules, and disclaimers of these linked sites as they may differ completely from ours. Schnauzers Rule does not accept any responsibility for any loss which may arise from any information, products, or services offered by any of these linked sites. Social Media Disclaimer: Schnauzers Rule reserves the right to add, remove and/or edit content in its sole discretion, on all our social media pages. While making every effort to monitor our social media for appropriate content in nature, please notify us immediately if you find any content that might be considered otherwise, so we may evaluate and remove the content if necessary. Schnauzers Rule shall not be held responsible for inappropriate content, images or third party links submitted by other users. We expect partcipants to treat each other with respect and will not allow any posts or comments that include personal attacks, offensive language, or ones that are off-topic or any promtotion of products or services. We reserve the right to delete such posts and may ban the user of repeated offenses. User hereby releases Schnauzers Rule from any and all liability in connection with the use of any and all our social media pages. Medical Disclaimer: No medical claims or advice is ever given by Schnauzers-Rule.com. The information on our website is provided as informational and educational purposes only. By using the website you acknowledge, understand, and agree that all decisions regarding the health and well-being of your pet are completely your own. At no time is the website information intended to diagnose, treat, or cure your pet and is not a substitute for veterinary care provided by a licensed veterinarian. For any medical or health related advice concerning the care and treatment of your pet, always consult your Veterinarian. Please keep in mind that veterinary medicine and information changes rapidly, so some information on this website may be out of date. No guarantee is given that the information provided in this website is correct, complete, and/or up-to-date. Never disregard professional veterinary advice or delay in seeking professional veterinary assistance because of something you read or saw on Schnauzers-Rule.com. If your pet is in need of advice on any matter of health care, the safest and best thing to do is to seek the advice of your local veterinarian so an accurate diagnosis can be made and appropriate treatment or therapy can be prescribed for your pet. Please do not use this website to self-diagnose and/or treat your own pets. Any information on treatments, drugs, doses, foods, and pet care contained on Schnauzers-Rule.com is strictly designed for informational purposes only and should be used to further your research and discussions with your own veterinarian. Never give your dog any medication without first consulting with your veterinarian.